In a low-scoring defensive battle, the Twin Falls Bruins and Wood River High School Wolverines went head-to-head Wednesday night in Great Basin Conference girls’ basketball on the Bruins hardwoods. And it came down to the end. Wood River, trailing by 11 points in the fourth period, battled back with a strong run but ultimately fell to the Bruins 33-30. Twin Falls swept the season series, having won in Hailey by a similar 34-30 score Dec. 1. Senior post Haylee Thompson (14 points, 6 rebounds) notched her 13th consecutive double-digit scoring game of the season and moved her three-year Wolverine career scoring mark to 607 points in 61 games, good for seventh place on the all-time scoring list and 33 points away from fifth place. Haillie Taylor, another Wolverine senior, added 6 points including a 3-pointer while senior Cheyenne Swanson added 4 points and 8 boards. Wolverines with 2 points apiece were Hannah Belloli, Emmalie Dion and Rory Cole. Megan Lounsbury (7 points) led Twin Falls. With its win Twin Falls (10-5, 5-1 league) pulled into a first-place tie with the Jerome Tigers (12-2, 5-1). The Bruins have won five of seven games since their 11-point home loss to Jerome Dec. 9. Meantime, Jerome was an upset 46-41 loser at Minico (10-5, 4-2) on Tuesday. Twin Falls visits Jerome for a first-place showdown Tuesday, Jan. 17. Before that, Jerome will host Burley (6-8, 2-4) today, Friday. 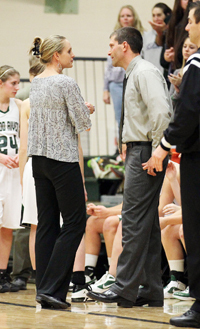 Burley was a 58-39 winner over Canyon Ridge (4-11, 0-6) in another league game Wednesday night. Wood River will welcome back senior point guard Kaitana Martinez for today’s Great Basin game against Canyon Ridge on the Hailey hardwoods. The two teams played Dec. 7 in Twin Falls, with the Wolverines winning 36-32. Next Tuesday, Wood River visits Burley. A solid team effort by the Wood River Wolverine boys’ varsity basketball team fell short Tuesday night in a 43-37 Great Basin Conference loss to the Canyon Ridge Riverhawks in Twin Falls. It was the first league win for Canyon Ridge (3-8, 1-2). Wood River (2-7, 0-3) lost for the fourth time in five games. Seven different Wolverines scored points in a contest that was close until the end—Stone Sutton 8 points, Dylan Carey 8, Austin Hafer 7, Colton Larkin 6, Jake Vegwert 2, Quentin Dowdle 2 and Ben Williams 2. Wood River played another league game, this one at home, against the Minico Spartans (1-7, 0-2) on Thursday night. The Wolverines visit Filer (7-4) Saturday, Jan. 14 for a 5 p.m. matinee and entertain Kimberly (6-2) Tuesday, Jan. 17. Kimberly edged Wood River 55-47 in the Nov. 30 season opener. Other league teams are Jerome (11-1, 3-0), Burley (7-3, 2-1) and Twin Falls (9-1, 2-0). Jerome edged Burley 45-36 on Tuesday night. Ranked No. 2 in the Idahosports.com 4A poll, Jerome puts its seven-game win streak on the line when it visits Canyon Ridge today, Friday. Jerome hosts Twin Falls for the first time Jan. 20. Coach Lane Durtschi’s Carey Panther girls showed Tuesday they can play evenly with last year’s State 1A Division 2 tourney runner-up Richfield. Now, Carey has to figure out a way to beat Richfield. Richfield (8-3, 4-1 league), trailing 28-25 entering the fourth quarter of Tuesday’s Northside Conference battle in Carey, ripped off a 20-9 run in the final eight minutes to carry home a 45-37 victory over the Panthers (4-4, 1-3 league). Senior guard Sasha Kent of Richfield led the visiting Tigers with 23 points. Richfield outscored Carey 12-6 at the free throw line. For the Panthers, senior Micaela Adamson had 17 points, Jessica Parke 12, Nicole Gomez 4 and Morgan Parke 4. Carey traveled to Sun Valley for a Northside game against the Community School (0-6, 0-4) Thursday night. The Panthers entertain the Castleford Wolves Tuesday, Jan. 17. Castleford (4-4) beat winless Murtaugh by a 57-28 score on Tuesday night.